Growing an organic vegetable garden yourself is the absolute best way to bring the freshest, most delicious, most healthful vegetables possible into your kitchen and onto your plate. It's also something that can change your life - if you let it - inwonderful and unexpected ways. There’s something deeply gratifying about caring for the soil, nurturing plants, and eating vibrant food you’ve grown yourself that strengthens both the body and the soul. This article will introduce you to the basics of growing an organic vegetable garden and direct you to more detailed information that you'll need as you progress along your journey. Everything on Vegetable Gardening with Lorraine is about organic gardening, but this article specifically addresses some common questions. you get exercise and sunshine! To be considered organic by the USDA and other regulatory agencies, vegetables must be from non-GMO seeds, be grown without synthetic chemical pesticides or fertilizers, and not be irradiated or treated with chemicals after harvesting. For more benefits you may want to read The Top Ten Benefits of Organic Gardening. When you are starting an organic vegetable garden for the first time (or transitioning a chemical garden), it is important to perform a soil test, which will show if your garden soil is lacking in any nutrients. The best way to do this is through your local state extension service, which you can find online. They will provide you with instructions on how to sample your soil, and it usually costs around $20-25. Home test kits are generally not very accurate. If your garden is low in any specific nutrients, you can supplement your initial crop with appropriate organic fertilizer, available from your local nursery or garden center. But once balanced, an organic vegetable garden is best sustained by a steady supply of well-balanced, homemade compost. Compost is not optional or just a good idea, it is the essential foundation of an organic vegetable garden. All yard, garden, and vegetable kitchen waste should be composted for use on the garden, and there are a variety of compost bins, tumblers, and methods available. Compost provides humus and essential nutrients, and is also required for good soil structure. Soil structure is important for plant health and bug resistance. I love the whole science of soil ecology - most of us don’t realize that the long-term sustainability of life on planet earth is dependent on the health and balance of tens of thousands of different organisms that live in the soil, each of which has a specific job to do. Only an organic vegetable garden works with and supports soil ecology in this way. Chemical fertilizers kill soil life the way salt kills a snail. A great read in the wintertime, when you're dreaming of your summer garden but see only snow outside, is Teaming with Microbes by Lowenfels and Lewis. Bottom line: compost keeps soil healthy, which keeps plants healthy, which keeps us healthy. There are many different methods for laying out an organic vegetable garden, but only a few methods are truly sustainable in the long term. I have written an article on vegetable garden layout with details of the common methods, and advantages and disadvantages of each. You can also check out the raised bed vegetable garden article for a gallery of designs and plans. My personal preference is the double-dug or "French intensive" method of vegetable gardening. This has been scientifically proven over and over to be the highest-yielding method per square foot of any method of gardening or farming in the history of agriculture, while at the same time requiring the fewest inputs. If I could only own one gardening book, it would be How to Grow More Vegetables by John Jeavons. There are no colorful, inspiring photos, no glossy paper, and no frills, just the most essential, complete vegetable gardening information anyone starting out could want. 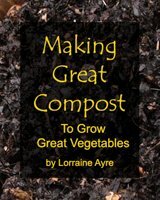 This book will teach you the double digging method of soil preparation, which is the garden layout that makes the most efficient use of space, water, fertilizer and compost. These may not work on every bug you may encounter, but they work on most of them. Neem oil is a fascinating substance that works in a number of different ways on pests, mostly by interrupting their reproductive cycle. Soap spray works pretty well on soft-bodied insects like aphids. Buy Alaska Fish Fertilizer from Home Depot, mix a Tablespoon in a spray bottle of water, and spray on plants. I don't know why, but it works great against flea beetles, which seem to be very partial to my beloved collard greens. (I think the fish emulsion just smells so bad that the flea beetles get nauseated and lose their appetite!). After your first year, you will want to begin incorporating some more advanced techniques to maximize the ongoing health of your garden. You will want to start planning ahead a little more. Each year when you work on your vegetable garden layout, you should have the previous year's layout in front of you so that you can pay close attention to crop rotation, companion planting, organic weed control and providing habitat for beneficial insects. Paying attention to all of these together is part of what makes an organic vegetable garden work in harmony with nature instead of against it. It's a bit of an art form (as well as a science) to juggle all these bits of knowledge into a synergistic whole, and it is both challenging and rewarding. And fall gardening is another whole adventure. It is possible to extend your yield of many leafy greens, root crops and cabbage family crops right up to and even past your first frost date in the fall, if you plan ahead (...way ahead). Check out the fall gardening article. Organic vegetable gardening can become an integral part of one's life, binding a person to the natural world of which they are a part, but from which feel apart. I love my computer, but I am not a machine, and need regular immersion in the natural world to recharge the natural cycles of my physical self.